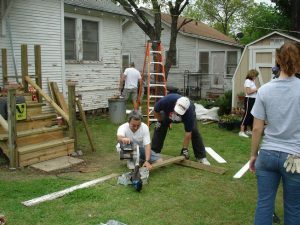 Serve the Community with Cornerstone UMC! Canned Soup drive that takes place every year around the Super Bowl. We provide care bags for anyone going through chemotherapy. This takes place at Spring Creek Elementary School. We provide decorated duffel bags for children in the foster system that replace the standard black trash bag they would be given when moving. We provide clothing for men who have completed their prison sentences and are ready to reintegrate back into society. Learn more about One Man’s Treasure. Visit the Amigos Days Project page. We create and prepare relief kits for disaster-stricken areas.